Dinner and Drinks in March welcomes back AYA’s very own former President, Austin Coppock! 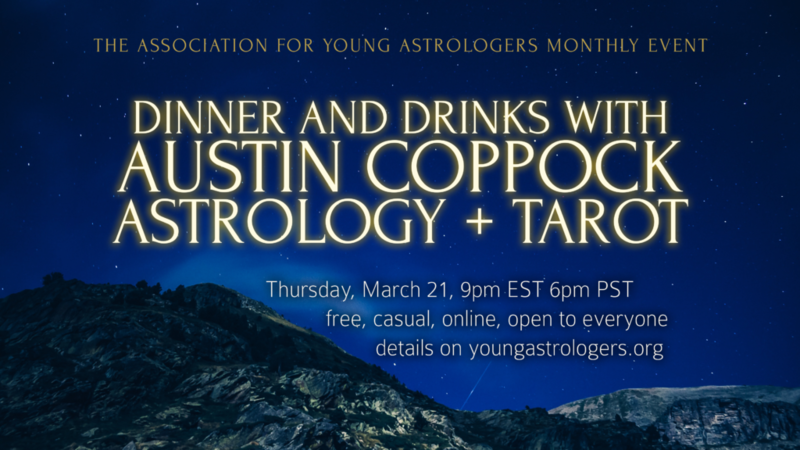 We are delighted to have Austin joining us on Thursday, March 21 at 9pm eastern, 6pm pacific to talk all things astrology and tarot. From the history and overlap of the traditions and symbolism to talking shop, there’s no better practitioner to have at this particular proverbial round table than Austin. While we all know and love him for his astrological work, his experience with tarot matches it─ he began the journey over 20 years ago. Tarot even makes a notable appearance in his book, 36 Faces. If you’re a fan of that work, there’s no better time to come and ask your burning questions about the tarot piece directly to the author! Grab a drink and bring your questions! As always, this event is free, casual, Q&A based, and open to everybody. We can’t wait to see you there!